Here in Minnesota, winter never slows us down. If you are looking for some fun winter activities in Minneapolis, we have some great suggestions. Explore great works of art and ancient history with the museum’s newest special exhibit. Pieces from Egypt’s Sunken Cities will be on display at the museum through April 14th. Explore the crafts and goodies from over 35 local vendors at the monthly farmers market. It will be held on February 17 starting at 10 a.m. at Chowgirls at Solar Arts, and once again on March 17. There will also be live music, entertainment, and other activities. The 10th annual Winter Beer Dabbler will be held at the Minnesota State Fairground on February 23rd from 3 – 6:30 p.m. This outdoor festival lets you sample and enjoy some great locally brewed beers. If you love cars as much as we do, make sure you add the Twin Cities Auto Show to your calendar. It will be held March 9th through the 17th at the Minneapolis Convention Center. If you want to get out and enjoy the snow, the Whitewater State park hosts guided snowshoe tours twice a month on Saturdays. Other parks around Minneapolis are up for exploration and offer snowshoe rentals as well. Minneapolis is never short on things to do in the wintertime, and we at Don Robinson Mitsubishi hope you stay safe and enjoy all that winter has to offer. If you’re in the St. Cloud area and are looking for opportunities to test your off-road driving skills, you’re in luck, as the area features plenty of great off-road trails that are perfect for switching into 4WD and getting the most out of your vehicle. At Don Robinson Mitsubishi, we carry a variety of All-Wheel Control vehicles, so it’s only fair that we share our favorite off-road trails in Minnesota. Situated in the Nemadji State Forest, this trail system is 71 miles long and features impressive twists, steep climbs, and tight passages, all overlooking some seriously stunning landscapes. If you’re looking for a great way to get the most out of your vehicle, this trail is for you. Located just East of the city of Gilbert, the Iron Range Off-Highway Vehicle State Recreation Area should be on the short list of every off-road driver. This huge park offers 36 miles of trails and takes you over a huge variety of terrains and elevations so you can really test your skills. If you’re looking for a wonderful way to spend an entire weekend, be sure to check out Bemis Hill Trails. An 85-mile system of trails perfect for off-roading, Bemis Hill is located on the shoreline of an ancient glacial lake which naturally carved out a beautiful and rugged landscape. For the ideal off-roader, stop into Don Robinson Mitsubishi and check out our lineup. Mitsubishi offers awesome value, as well as a commitment to excellence and quality, and that continuous dedication to innovation has brought the new 2018 Mitsubishi Mirage to fruition. 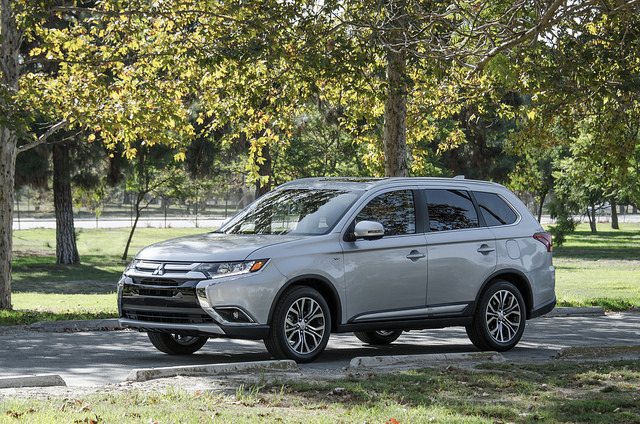 The new model launches this year with upgraded standard equipment as well as the great, affordable price tag drivers have come to expect from Mitsubishi’s lineup. And with all the perks to owning a Mirage, such as the best non-hybrid fuel economy in the business, you’re in for a great ride. The new Mitsubishi Mirage will sport a price tag just under $13,400 and comes with a standard 7.0-inch touchscreen display for the audio system. That, in turn, comes with Bluetooth ® wireless software that allows you to stream your favorite music and make hands-free phone calls. There’s also a USB port in the center console for charging or syncing your phone. You can still get features like Apple CarPlay and Android Auto or driver’s seat armrests as available options on upper trims. The new 2018 Mitsubishi Mirage is now available on dealer’s lots across the nation. 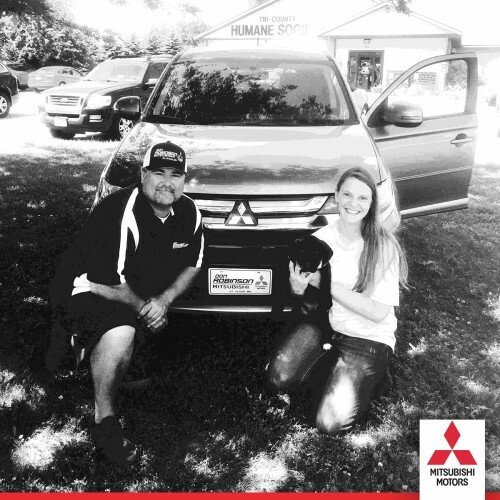 Come test drive one for yourself and experience its great reliability, value, and fuel economy, as well as all of its brand-new upgraded tech, at Don Robinson Mitsubishi. Adventure-seekers and outdoor-lovers: get ready. 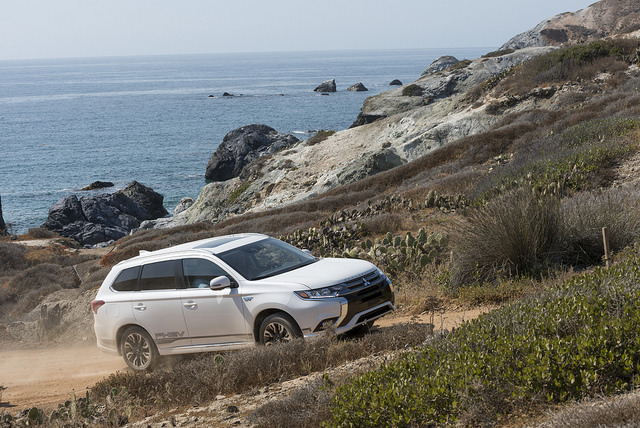 At Don Robinson Mitsubishi, the Outlander and Outlander Sport are waiting to take you on an adventure. Exploring Minnesota is easy when you’re behind the wheel of an SUV. There’s plenty of fishing to do in Central Minnesota. Otter Tail County is the ideal place for fishing, where the multiple lakes are full of bass, panfish, and northern pike. At Mille Lacs Lake, there are even guided launch trips. Getting there is a breeze with a capable SUV. The beautiful views in Minnesota aren’t just for looks. The woods and mountains provide great hiking trails. At Portsmuth Overlook, you can enjoy a refreshing hike with an amazing view. If you want a view from an observation tower, then make the trek up Mille Lacs Kathio State Park’s tower. Strap your bikes to your SUV’s roof and switch out your car tires for bike tires for a bit. Central Lakes State Trail and Bunyan State Trail are two paved trails you can take if you aren’t feeling incredibly rugged. If you’re in for an adventure, the Lake Wobegon Trail stretches through farms, lakes, and wetlands. If you need an SUV to take you on all these adventures, you know where to find it! 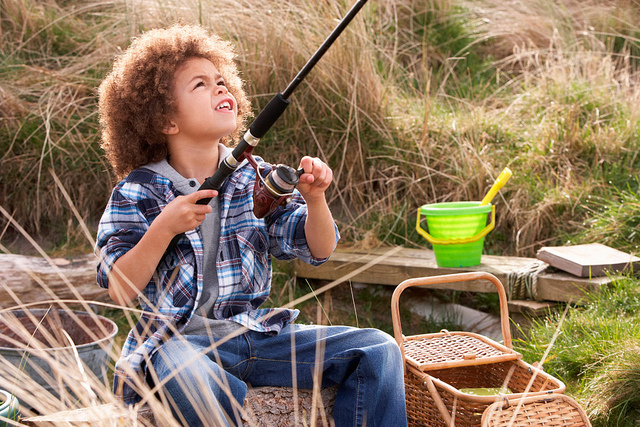 Come on down to Don Robinson Mitsubishi so that you can begin enjoying the great outdoors of Minnesota. Want to do something good for your community? Here are some volunteer opportunities you can take part in in St. Cloud, Minnesota, courtesy of us here at Don Robinson Mitsubishi. You can become a volunteer for the American Red Cross at their St. Cloud Donation Center. Volunteers help assist the Red Cross by greeting and registering donors and offering refreshments. Hours are flexible, so you can work around your work schedule. 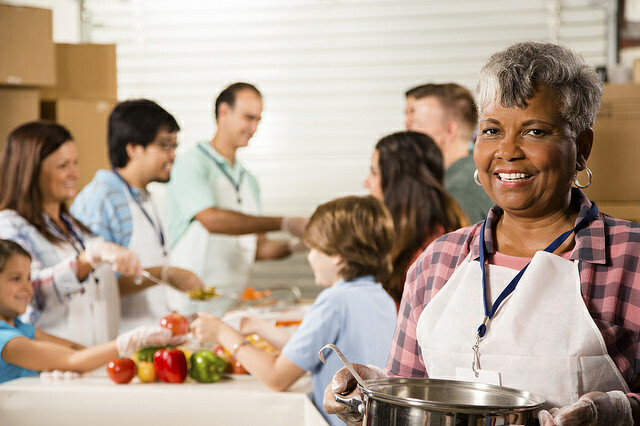 The Whitney Senior Center has various volunteer positions open, from hosting weekly events to teaching or leading workshops. Have a special talent you want to share with people? Here’s your chance. The Salvation Army will always accept volunteers in areas like food serving, food shelf staff, and cooking. Volunteering in these areas means that you’ll get to help feed the members of your own community who are in need. This local humane society helps find homes for cats, dogs, or other animals that come through their doors. You can volunteer to transport animals, walk them and keep their kennels clean, or even photograph them. What’s better than hanging out with dogs and cats? Volunteering is a great, selfless way to enjoy the community of St. Cloud. There are even more volunteering opportunities than this, so get out there and look for the right fit for you. Summer vacation is fleeting for many college students, which means it’ll be time for back-to-school shopping in no time. In addition to school supplies, you should also check out a number of Mitsubishi models that are perfect for heading back to campus. 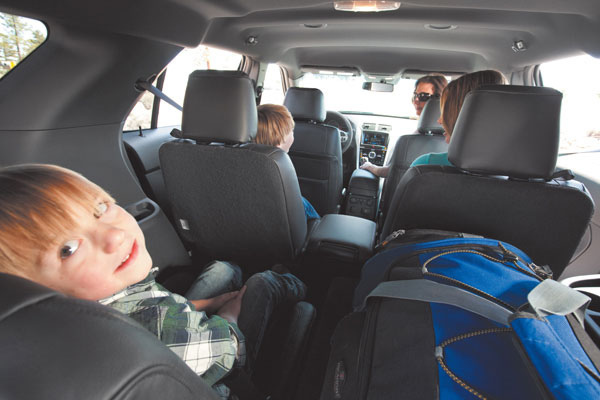 The best back-to-school vehicles include the Outlander, Outlander Sport, and the Mirage, thanks to their roomy interiors, affordable pricing, and great gas mileage. According to Mitsubishi, the new Outlander comes with a range of great features that are perfect for moving back to campus. This crossover SUV gets up to 30 highway mpg* when properly equipped, which saves you money at the pump. The roomy interior can easily fit many of the furniture and supplies you need to move, with a cargo capacity of up to 63.3 cu ft.
For those who want to look especially cool, check out the new Outlander Sport. This model has less seating than the standard Outlander, but the Sport comes with improved capabilities. You can easily explore off-road trails, bike, hike, and more. The Outlander Sport is bound to make other drivers jealous. Finally, the Mirage is a classic among students headed back to school. This subcompact model saves on space, gets up to 43 highway mpg*, and still seats up to five. It’s one of the most affordable cars on the market, and it also comes with an impressive 10-Year/100,000-Mile Powertrain Limited Warranty. Looking for the most bang for your buck? 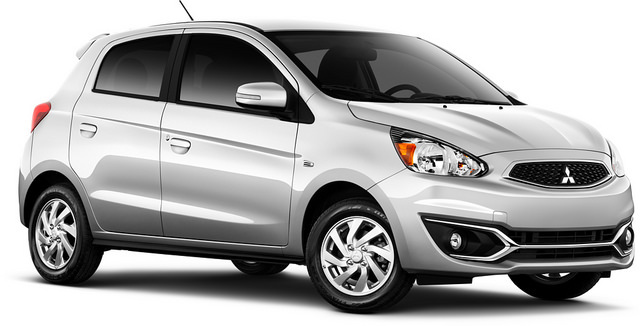 Check out the Mitsubishi Mirage. 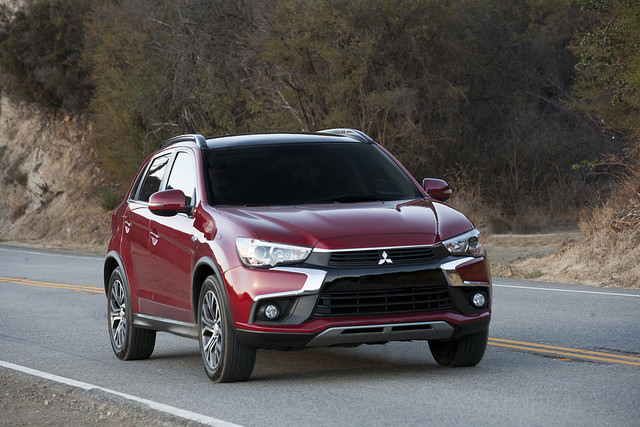 To test drive or explore the Mitsubishi Outlander, Outlander Sport, or Mirage, visit Don Robinson Mitsubishi today. *EPA estimates. Actual mileage may vary. For comparison purposes only. If you’re looking for a new adventure in the state of Minnesota, there are tons of trails to explore. Whether you like hiking, bird watching, or biking, there’s truly something for everyone. Plus, you can easily find any off-road destination in a Mitsubishi Outlander, the perfect vehicle for the trip. With added storage space and a rugged exterior, any off-road adventure is a breeze. One of the top Minnesota trails, according to TrailLink, is the Dakota Rail Regional Trail. This 26.6-mile trail is composed of asphalt and gravel, which is perfect for most beginners. As part of the Rails-to-Trails Conservancy, this trail was converted from old rail lines. Activities include biking, inline skating, fishing, and even cross country skiing. Plus, it’s wheelchair accessible. Lake Wobegon is also a popular trail in the area. This one is a whopping 60 miles, with an asphalt surface that is also built on an old rail line. Biking, skating, walking, and snowmobiling are all perfect for this trail, and there are great places to fish along the way. Again, this trail is also wheelchair accessible, making it perfect for those with limited mobility. Finally, hop in your Mitsubishi and drive to the Paul Bunyan State Trail. Measuring over 119 miles, this asphalt trail passes through forests, over 10 rivers and streams, and along more than 20 lakes. There are tons of flora and fauna, and campgrounds are located at both ends. Like the other trails mentioned, this is an accessible asphalt trail built on old rail lines. Planning your next adventure already? To find the perfect car for the job or any accessories you might need, visit Don Robinson Mitsubishi today. Louis, Missouri: The city with the famed Arch offers a lot to do, including the City Museum. It’s a 10-hour drive from St. Cloud, meaning you can make it there in a just a day’s drive. Sandusky, Ohio: Sandusky is known for having what is arguably the world’s best roller coaster haven: Cedar Point. A 12-hour drive from St. Cloud is all that is between you and a couple of days riding coasters on the beach. Make it a theme park trip, and drive another 4 hours to experience Ohio’s Kings Island near Cincinnati. Denver, Colorado: The city of Denver has plenty to offer culturally, and it’s just a 13-and-a-half-hour drive. If you switch off with your spouse, you’ll be able to make it to the Mile High City in your Mitsubishi SUV in just one day. Chicago, Illinois: The Windy City is the closest option on this list, but perhaps offers the most to do, whether you’d like to spend time on the beach or explore downtown. You and your family can be there in just a 7-hour drive from St. Cloud. Be sure to bring your Mitsubishi in for routine maintenance at Don Robinson Mitsubishi before any road trip this summer. When most new vehicles leave the assembly line, they have been outfitted with all-season tires. 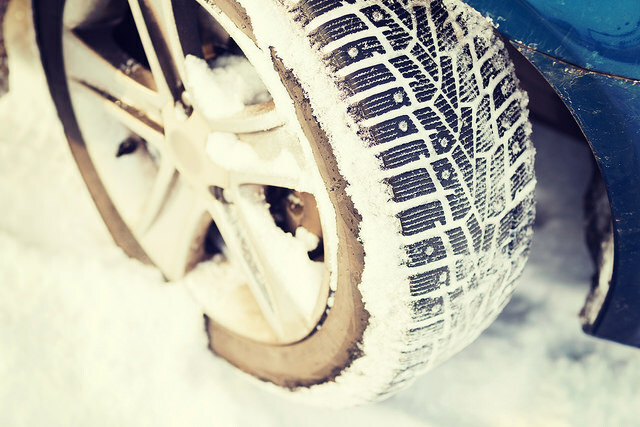 For many drivers, these tires are more than enough to get vehicles through all four seasons just fine. However, if you live in a particularly snowy part of the country, you might be considering winter tires. How do you know if they’re right for you? Tread rubber on winter tires is designed to remain flexible, which allows the tires to grip the road, even when there is little traction. Traction is also improved through more “biting edges,” which are small slits in the tread that allow the tires to grip better. Deeper tread depths, as well as customized tread patterns, also work to give drivers better traction in snow and on the ice. If you live in an area that sees a fair amount of snow in the winter, such as here in St. 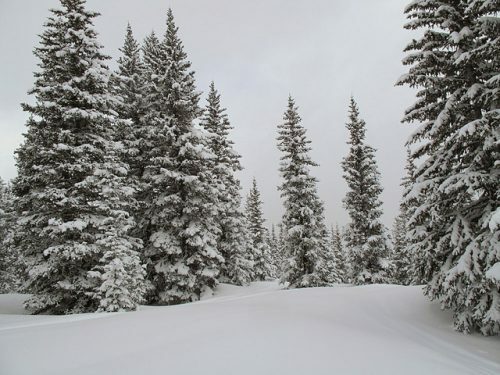 Cloud where we see nearly 50 inches of average snowfall, then you’ll want to consider winter tires for the snow. In the market for new tires? Check out the Don Robinson Mitsubishi tire store, with big name brands such as Firestone and Goodyear available for your Mitsubishi SUV or car. 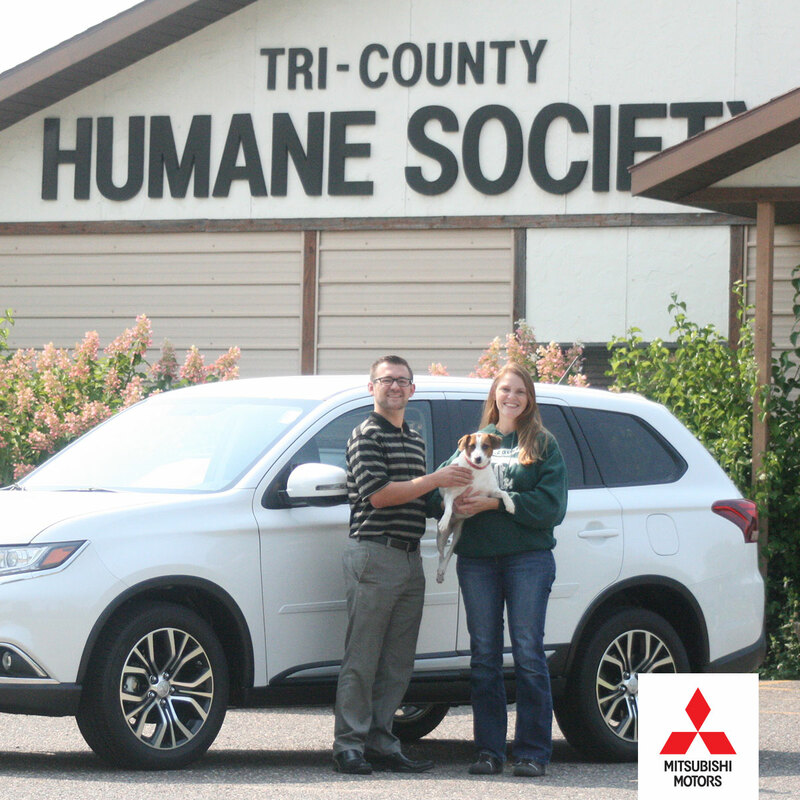 Don Robinson pledged to donate $1 for every new page like to our Facebook page to the Tri-County Humane Society in St. Cloud, MN. From July 15th to August 19th, we ran our campaign to raise money, and with the help of the Humane Society we were able to reach a lot of new fans! After five weeks, we raised a total of $806 for the Humane Society! This campaign was created because Don Robinson is a big dog-lover and wanted to give back to those who help take care of animals. Spurred by this and his desire to help out man’s best friend, he sought out our local Humane Society to find a way to give back. Thus our Like Campaign was formed as well as a lasting friendship with the people at our local shelter. Don Robinson spending some time at the Tri-County Humane Society with Marit Ortega and the cutie Lucas. Because of the success of this campaign and the bond formed with the Humane Society, Don Robinson Mitsubishi wants to continue to help by finding great homes for the animals they care for. Because of this, we will be featuring a “cutie of the week” every Friday on our Facebook page for our existing and new fans! We hope this will continue to benefit the Humane Society and we are proud to continue to support our local shelter in this fun and rewarding way! Be sure to stop by our Facebook page every week to see which “Cutie” we will be featuring!